Tiger Woods is returning to professional golf, and is already set in for a tournament this week. The golf great announced his return at a press conference on Tuesday, after he spent nearly 10 months of not playing in a golf tournament following a fusion surgery on his back in April. Woods will be playing at the Hero World Challenge at 12:05pm on Thursday. The 18 man field with no cut golf match will take place in Nassau, the Bahamas. Woods is paired with this year’s FedEx champion, Justin Thomas. Speaking to the media, the 41-year-old Tiger Woods said he is living and loving life. He mentioned that he no longer relies on pain medication in order to cope. However, Woods says he sees this tournament as a test since he does not know what to expect. He says: “I don’t know what my body can or can’t do. I still don’t know”. Woods added on to say that he feels positive that his prolonged back problems are in the past. “I don’t have the nerve pain going down my leg, and I don’t have my leg twitching all over the place. I don’t have these issues anymore, so I’m loving life now,” said Woods. “This surgery was about quality of life, because I didn’t really have much. I’d been in bed for nearly two years and wasn’t able to do much,” he added. Woods will be making his first appearance this week since he withdrew from the Dubai Desert Classic earlier this year. The Hero World Golf Challenge is a golf tournament hosted by Tiger Woods every December. The event features 18 of the world’s most renowned golf professionals, contributing to the Tiger Woods Foundation. 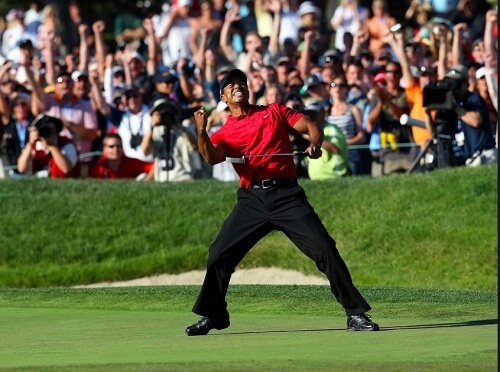 Sports bookmakers are excited to have Tiger Woods back. His return has online betting site, Bookmaker.com, offering striking wagers on career futures. The sports betting website offers +248 odds for Woods to announce his retirement before 1 January 2019. The site is also paying bettors +130 odds if they think Woods will require another surgery, and many more offers. Overall, Pokies.com wishes Tiger Woods well on all his upcoming tournaments. What are your thoughts on Tiger Woods return?